N-85 - Dan Scott and Associates, Inc. Whether it's for an emergency situation, bedside monitoring or routine spot-check, theOxiMax® N-85™ handheld capnograph/pulse oximeter delivers accurate SpO2 and end-tidal CO2 values. 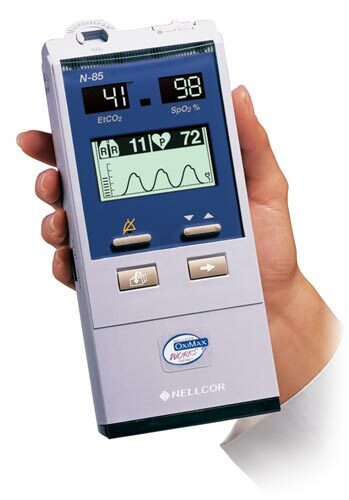 This portable monitor contains Nellcor's latest OxiMax pulse oximetry and is compatible with OxiMax sensors. The N-85 monitor also features patented Microstream® CO2 technology and breath sampling accessories to ensure smooth operation, even in high humidity environments.